Looking for Fernie accommodations? 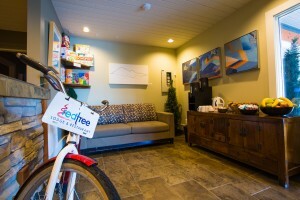 The Red Tree Lodge offers a wide variety of amenities that keep our guests coming back. Take a peek at what all our accommodations offer. Complimentary to all our hotel guests, our Breakfast Snack is available daily in the hotel lobby from 8am-11am. Featuring muffins, fruit, yogurt, coffee, tea and hot chocolate; it’s enough to get you going. Our Guest Internet Terminal is complimentary to all hotel guests and allows you to stay connected while at work or on vacation. In addition, all of our Fernie accommodations receive complimentary WIFI. Enjoy a dip our indoor swimming pool, open year round. Conveniently located next to our Games room. Open daily from 2pm – 10pm and we can accommodate you earlier upon request. We’re all about adventure and the outdoors, and nothing feels better than relaxing your sore muscles in our hot tub and sauna after a long day mountain biking or riding on the hill. Open daily from 2pm – 10pm and available earlier upon request. At the Red Tree Lodge we’re outdoor enthusiasts, but the sun doesn’t always shine in Fernie. We want our hotel guests to experience all that Fernie has to offer, that’s why We Share Our Toys! Whether your visiting during the Summer or Winter, guests receive complimentary use of our toys. Our Guest Kitchen allows our guests to feel more at home. A large space to cook your own meals, prepare lunches and even bake cookies! It is equipped with two ovens, two microwaves and all the utensils, dishes and cutlery you could need. Clean up is made easy with our two dishwashers. All of our guests to our Fernie accomodations receive complimentary use of our guest laundry facilities. Laundry detergent is available for purchase from the Front Desk. Our pool table, foosball and poker table are great ways to enjoy our games room. We also have a variety of board games available free of use including: Pictionary, Monopoly, Jenga, Checkers, Hungry Hippos, and many more. Darts are also available. With plenty of couches, sit back and enjoy a movie, or watch your favorite sport in action in our movie theatre. We are pleased to offer a large variety of movie rentals, free to all our guests. During the summer months guests have access to our BBQ and picnic area. Cook up a steak from Back Country Meats conveniently next door and pair it with some corn on the cob and potatoes…. delicious! BBQ cooking utensils are available from the Front Desk. Conveniently located in the West parking lot, our mountain bike wash station provides an easy and hassle free way to clean the mud off after an amazing ride on Fernie’s extensive trails. Our boot wash station is great for workers who need to clean their gear after another successful day at work. In the winter, a tuning room is available for prepping your gear for another epic day of riding. Located in the same room are our ski lockers, available free of charge. These lockers are to ensure no damage to our rooms or your gear. Locks and a tuning kit are available from the Front Desk.